Dynomax 2.5 in. 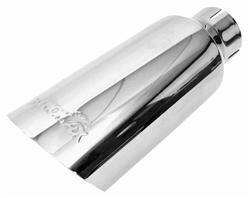 Polished Exhaust Tip 11.0 in. Long [Dynomax 36458 Exhaust Tip] - $29.95 : 3rd Strike Performance, Your Source for Late Model MOPAR Performance Parts and Accessories! Bolt on the custom look of Dynomax exhaust tips. Available in a variety of inlet/outlet sizes and overall lengths, these single- and double-wall tips are crafted from high-grade 304 stainless steel for durability. They feature a clamp-on design, a mirror-polished finished, and the embossed Dynomax logo. Add performance and aesthetics to your ride with exhaust tips from Dynomax. Overall Length (in): 11.000 in.